LG Secret Can Capture High Speed Divx Movies | OhGizmo! If you’re a cellphone nut who demands all the latest features and advancements in their handset, you’re probably going to pass on the LG Secret. But if you’re a photographer or amateur videographer, the Secret might have one feature that would be hard to pass up. The 5 megapixel camera can record video directly to the Divx format at speeds of up to 120 frames per second. So it’s the perfect phone if you’re walking home and happen to encounter a Michael Bay-esque action sequence or giant tanker truck explosion. 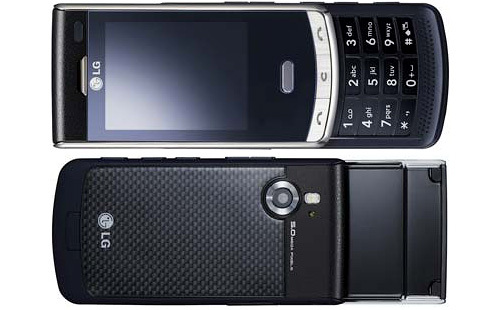 Other features of the LG secret include a carbon fiber case which is not only strong, but also looks really cool. 100MB of internal memory that can be expanded with a microSD card, Bluetooth, a sliding keypad, FM radio, support for Microsoft Office documents and a Google package for surfing the web, accessing Gmail or watching YouTube videos. It will be available in May starting with a European launch, followed by Asia, South America and then the rest of the world. The quite good model, but she on design to not like me.